If you have more than one catering or restaurant location then the optional CaterShark Locator Module may an excellent option for your business. 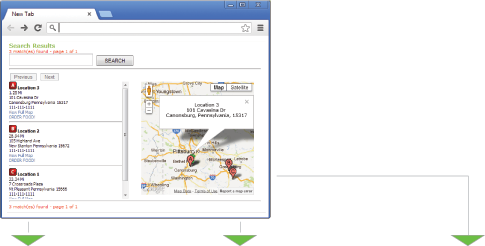 The Locator module allows online users to find your closest location. Powered by Google Maps your stored locations are dynamically plotted by us and then made available for your clients. 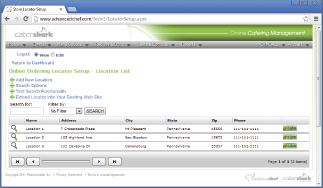 Each location menu can be independently configured for custom menu selections. Configuration - Within your Administrator section of CaterShark you need to enter all your Restaurant or Catering locations. This is located under Account > Online Ordering Store Locator Setup. These locations can then be associated with Location Menus you already have setup within your system. Add Link or Embed in your Existing Site - We dynamically provide you a link or embed code that you can place in your existing website or on your new CaterShark site. Simply copy and paste the code and your Restaurant or Catering locator is ready to go. Locations Plotted on Google Maps - Clicking the Link will plot all of your location on map and allow users to select the location that best suits them. Each location has a unique “Order Food” link that directs them to the Online Menu Options specific to that location. 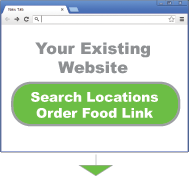 Place Order Online - Users can then place their online order to the location selected.